A focus on the principles of obtaining peripheral and capillary blood samples. Anatomy and terminology with emphasis on cardiovascular and circulatory. Specimen collection and processing, communication skills, clerical, safety standards, legal, ethical and professional credentials covered. Laboratory simulators give a hands-on approach to enhance classroom learning. 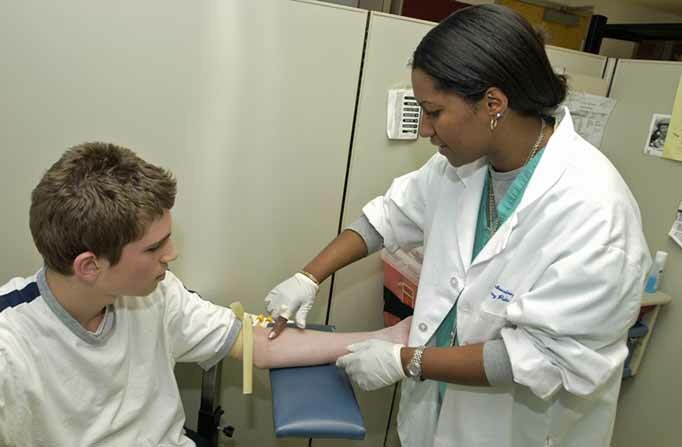 BLS Health HealthCare Provider certification, NHA Certified Phlebotomy Technician exam, book fee and student professional liability insurance included in tuition. Student is responsible for fees associated with obtaining a background check, physical exam, uniform, appropriate vaccinations and medical records. Anyone interested in registering for the Phlebotomy Fundamentals program must attend the information night. Prerequisite: Medical Terminology, Human Anatomy and Physiology. Clinical locations and schedules may vary from one student to another. Students must accept their assigned location and schedule, which is determined by the clinical site based on availability and staffing. The 100 hour clinical rotation are typically an 8-hour shift, Monday through Friday starting as early as 4am. No evening or weekend clinical rotations are available.